Cleaning the hull of a vessel is essential when it is left in-water. Marine life will begin to grow on the vessels hull and underwater components. This will result in increased fuel consumption, a reduction in overall power and performance, a reduction in heating and cooling system efficiency, and faulty or erratic instrumentation readings. Anti-fouling paint is used to inhibit marine growth on the hull and running gear but is limited by the amount of vessel movement, the speed at which the vessel travels through the water, the amount of biocides in the anti-fouling paint, and the location at which the vessel resides. Marine growth usually begins as soft slime and algae-type grass on the vessels hull, followed by hard calcareous barnacles on the running gear. We recommend for most operators to have their vessels cleaned on a routine monthly maintenance schedule from March through November with a mid-winter service in January. Growth slows significantly during the winter months but it doesn’t stop. Our practice is to utilize the least aggressive means necessary to effectively remove the marine fouling from the vessel. The more aggressive a diver is while servicing a vessel, the more anti-fouling paint is scrubbed off in the process. This will result in a higher concentration of marine growth to remove during the next service and shorten the life of the current bottom paint system. Underwater inspections, photos, and video are often utilized for documentation and insurance purposes. Boat and Yacht Masters of Florida has the expertise and equipment necessary to perform underwater inspections and provide written reports of our findings. We can also provide underwater digital still photographs and record standard-definition video of the inspection and findings. 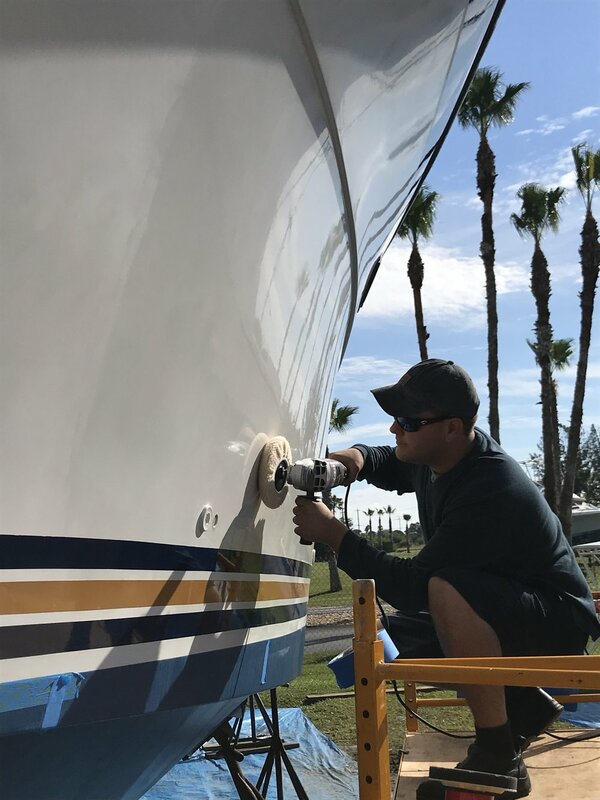 When propellers, rudders, shafts, nuts, and trim tabs are placed in saltwater, they will begin to corrode by the act of galvanic corrosion or electrolysis if not protected. Zincs installed on a vessel are considered “Sacrificial Anodes”. This is because they will sacrifice themselves (deplete / corrode) over time in order to protect other underwater metal components. Zinc is a metal which is less noble than other metals like brass. Therefore, when placed in electrical contact with a more noble metal, it will act as an anode, and give up its ions more readily than the metal it is in contact with. Frequent zinc inspections are necessary to determine if replacement is required in order to keep the vessels components from depleting or corroding themselves. Boat and Yacht Masters of Florida inspects the condition of all zincs during any underwater service and if replacement is required, can supply zincs from our inventory. A vessel of any size is a major investment for the owner therefore, proper care is essential in preserving the exposed surfaces and the value of your vessel. We incorporate Lawton Brothers "green clean" products into our into our boat and yacht interior cleaning services. This provides peace of mind to our customers that our products won't cause any damage to the vessel, furnishings or to the environment. Boat and Yacht Masters of Florida can tailor exterior and/or interior packages to meet your needs and budget. Owning and managing a yacht or large cruiser can be a daunting task for both the experienced and inexperienced vessel owner. Boat and Yacht Masters of Florida specialize in all aspects of yacht management, care, education, local consultation and have a complete list of services for the absentee owner. We also conduct personal shopping and provisioning to make your outings even more worry-free. Our team of well-qualified staff are prepared to act as the Owner's representative across the full spectrum of yacht management. We have developed great working relationships with many respectable marine-related service providers from bow to stern including marinas, mechanics, surveyors, charter companies and brokers. Our Management and Concierge services are not membership based, which allows us to be more responsive to the needs of our clients and to offer 24/7 service to all captains needing assistance.